It’s Best To Prevent Fires! Doesn’t that make total sense…?! Prevention of fires is much better than trying to fight them! No matter where you live; Myrtle Beach, South Carolina, the USA or elsewhere in the world; we all want to be safe from fires! What Fire Hazards Are There in Your Home? Items can catch on fire when they are place too close to anything that gets hot, such as space heaters. 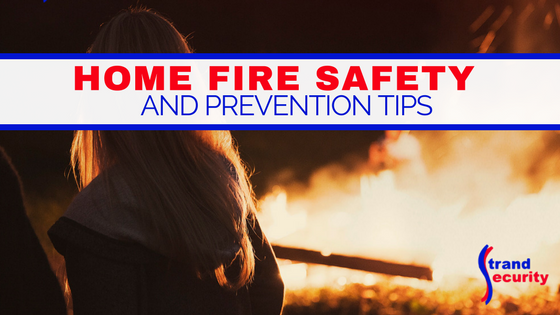 Children can start fires accidentally; they need to be watched when you have matches and lighters in the home. Portable heaters can catch on fire! Turn them off when you leave the room or go to sleep. Your kitchen can catch on fire; never leave the kitchen when cooking. Your stove can catch on fire; never leave a (frying) pan unattended. Your towels can catch on fire; keep flammable items away from the stove. Your pets can cause fires when knocking over kitchen items; keep pets away from the stove when cooking. Improper use of equipment can cause fires; never use camping stoves, gas grills, generators etc indoors. How Else Can You Prepare for a Fire? We suggest you and your family create a written fire escape plan and/or a family emergency plan. This plan should include escape routes in case of fire, dates of smoke alarm batteries installed, location of a fire extinguisher, where to meet up after escaping a fire and more. This family emergency and fire plan should be reviewed twice a year! Practice the Fire Escape Plan By Practicing Exiting Your Home! Don’t just keep your plan a written plan. Take it one step further and go and practice exiting the home along the escape routes If you need special escape ladders, take these out twice a year and make sure they are still in good working order. This is also a very good time to practice ‘stop, drop and roll’ with your kids and crawling to an exit. Don’t forget to check the batteries in your fire alarms as well as your carbon monoxide alarms at least once per year! Fire! Get Out First, Stay Out, Then Call 911. If you ever get caught in a fire, you will know what to do – and your chances of survival go up if you know what to do and how to do it – fast! Hopefully your fire alarms are working and are doing their job of alerting everyone in the house to the fact that there’s a fire! Do not do anything but follow the escape plan! First and foremost; get out and stay out! We know how important this information is and yet we also understand people do not have the patience to read long articles. That’s why with this important public safety announcement, we’ve created an infographic to make sharing this article and this information to social media so very easy! Here it is; feel free to share it everywhere.